PLEASE READ this information carefully as it takes into account a lot of different factors for many differing requests. If you really don't like to read or watch the video and just want an answer RIGHT NOW, skip to the end for the TL;DR info. Also, when asking a telescope question, start a new post so everyone sees it; otherwise it will get lost in the comments here about this particular post. The last couple of weeks have a number of articles on the five naked eye visible planets in the morning sky. A lot of them are well meaning, but don't offer much help in the way of assisting the observer in identifying the stars AND planets visible, or specifically when and where to look. I created this chart to specifically tackle that issue. You can download the five planet identification guide here. Also, check out the homepage for a video on finding the planets, along with other great "how to find it" videos. 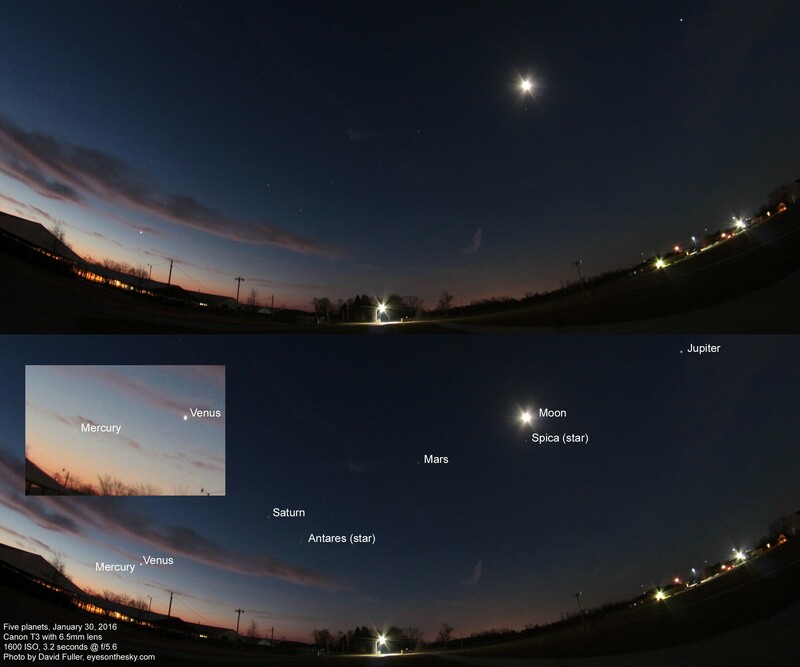 On January 30, 2016, I took a photo of the sky with these planets in it (see below) Although the Moon was near Spica then, it will move towards Mars, Saturn and eventually Venus and Mercury by February 6th. The text below is what was posted on the home page of Eyes on the Sky for quite a few months earlier this year, but the hiatus ended this week with a new Eyes on the Sky video in a different format, and some Stellarium "how-to" videos. Eyes on the Sky began 7 years ago as a simple article in a local newspaper. It graduated to YouTube videos in late 2010, and became a monthly video highlighting what people could see in the sky, interspersed with "Dark Sky Facts" to educate about light pollution. Later in 2011, Eyes on the Sky went weekly, and remained that way until early 2015. It was a Herculean effort, requiring a minimum of 8 to 12 hours per week, with just some donations to help defray some costs, and me largely the only person to do everything: Writing, researching, shooting and editing video, hosting, uploading, attending to social media, etc.. But the goal was always the same: Educate about light pollution by talking about what could be seen in the night sky.